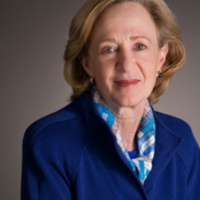 Susan Hockfield served from 2004 to 2012 as the sixteenth president of the Massachusetts Institute of Technology, the first life scientist and first woman in that role. She is now President Emerita, Professor of Neuroscience and a member of the Koch Institute for Integrative Cancer Research. As president, Hockfield strengthened the foundations of MIT’s finances and campus planning while advancing Institute-wide programs in sustainable energy and the convergence of the life, physical and engineering sciences. She helped shape national policy for energy and next-generation manufacturing, appointed by President Obama in 2011 to co-chair the steering committee of the Advanced Manufacturing Partnership and by serving as a member of a Congressional Commission evaluating the Department of Energy laboratories in 2015. As a biologist, she pioneered the use of monoclonal antibody technology in brain research, identifying proteins through which neural activity early in life affect brain development. She discovered a gene implicated in the spread of cancer in the brain, providing a link between her research and human health. Prior to MIT, she was the William Edward Gilbert Professor of Neurobiology, Dean of the Graduate School of Arts and Sciences (1998-2002), and Provost (2003-2004) at Yale University. She studied at the University of Rochester and Georgetown University and carried out research at the NIH and UCSF before joining the faculty at the Cold Spring Harbor Laboratory and then Yale. She has published extensively, in scientific and public media. She is chairman of the American Association for the Advancement of Science and currently serves as a director of General Electric, Partners HealthCare System, and the Council on Foreign Relations, is a life member of the MIT Corporation, a trustee of the Boston Symphony Orchestra, and a board member of the Belfer Center at the Harvard Kennedy School. She has received many academic and civic awards, as well as numerous honorary degrees from national and international universities.